For campervan hirers all over the county of Staffordshire and those visiting it, campers can be rented from bases including Stafford, Stoke-on-Trent and Wolverhampton. VW vans may also be found in Cannock, Lichfield, Walsall, check the listings on this page for more information about the vans themselves including their availability and pricing. For details about the features of the vans listed take a look in their profile pages. Have a great trip! I am Rosie VW, hire me today! 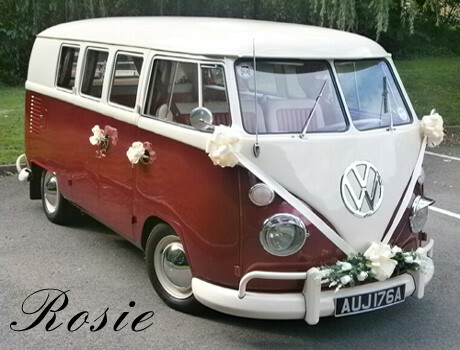 CHAUFFUER DRIVEN WEDDING HIRE ONLY Rosie is our 1963 Splitscreen camper available for chauffeur driven wedding hire ONLY. When enquiring please provide postcodes of pick ups, venues and any other journey 's required. Scooby is a top of the range Volkswagen T5 Transporter, professionally converted for the ultimate driving / touring experience! With a Map Themed Interior, The Colonel is a lovely yellow T25 high top!! High enough so that even tall folk need not crouch! Born in 1985, then spruced up in 2015 with a new interior and a new engine, he's a thing of beauty!